Since 2001 it's our policy to force an upgrade (free) once or twice a year to the free/unregistered (Home and Student) edition  to make sure you are always using the latest stable and most complete version. This is the only way to make sure everybody is using the most recent version. In the past we were receiving too many emails from people with feature requests and bug reports that had already been implemented or solved in the new version. Starting from 2012 the required upgrade has been reduced to once a year. The new-version date is a pre-built in date. No connection to the internet is made when determining if there is a new version available. When you start a utility in ASAP Utilities  and this new-version-date has come, you will get a notice about the new version. 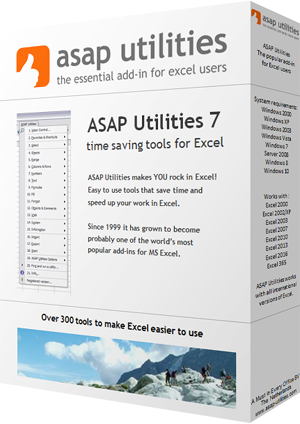 When you click on the "Download from www.asap-utilities.com" button, Excel will try to open www.asap-utilities.com in your default browser. It will not automatically download the new version, you have to download the new version yourself and perform the installation. 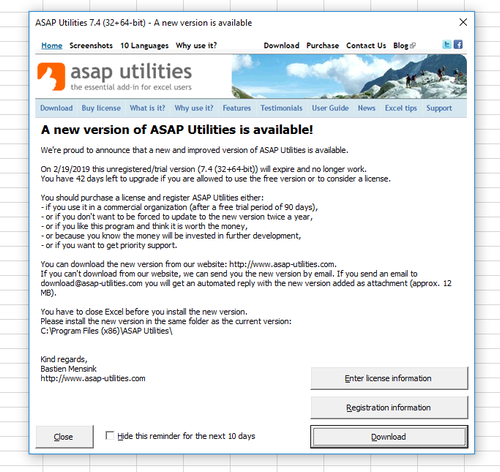 This message will be shown only once a day when you start one of the ASAP Utilities tools. You have the option to turn off the message for the next ten days. This way you can continue to work without being bothered too much. Make sure you do the upgrade before the end date is reached. After the end date the current (old) version will no longer work. I'm sorry, but this is the only way to make sure people are using the most recent version. In the past we were receiving too many emails from people with feature requests and bug reports that had already been implemented or solved in the new version. Subscribe to our newsletter and you will receive free e-mail updates when a new version or an important update of ASAP Utilities is released. If you have a purchased a license and entered the license details in ASAP Utilities, then the program will never expire. You can choose your own time to upgrade to a newer version or just stay with your current version. This is a major benefit for large organizations with locked down computers. Buying a license for ASAP Utilities is possible since March 2007. 1) Only the unregistered Home and Student Edition is forced to upgrade. With a license ASAP Utilities will never expire. 2) Starting in version 4.0 the update notice will not anymore be shown on Excel's startup but only when you start one of the ASAP Utilities tools. In version 3.10 the update notice will be shown during the upgrade period when you start Excel.